This near original one bedroom ground floor apartment is an enticing entry-level opportunity for savvy first time buyers, renovators and astute investors eager to acquire property with a highly sought after Aberfeldie address. Just metres from scenic Aberfeldie Park, Maribyrnong River trails and Buckley Village cafes, shops and buses, its location is without compromise. Enjoying loads of natural light are a separate living/meals area, with modern timber floors, and serviceable kitchen displaying electric stove, laminate benches, storage cupboards and tiled floor. The bedroom is big and boasts built-in-robes. A dual-purpose bathroom links directly to the bedroom and offers shower over a bath, basin and toilet, as well as laundry function. 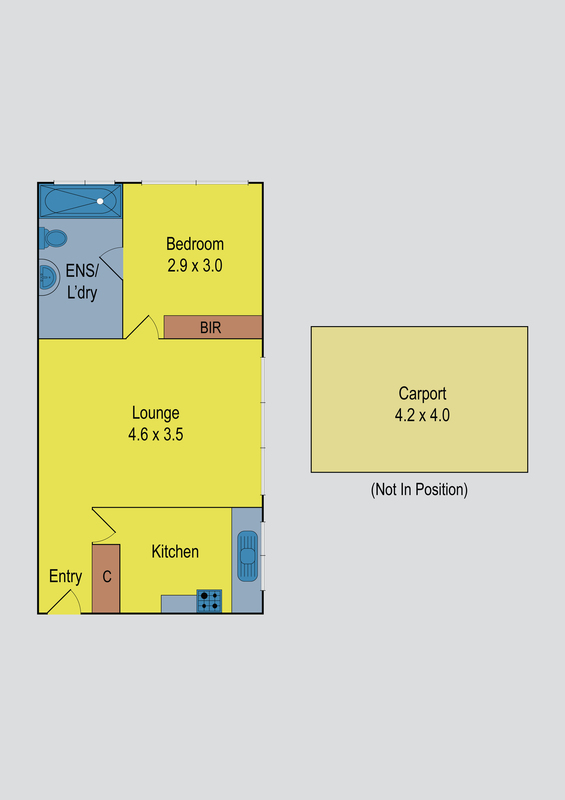 Modern comforts include panel heater, blinds, hallway cupboard, secure foyer/intercom entry and rear carport. Located along a prized street, surrounded by quality homes, it’s also within close proximity to Essendon station, riverside cafes, Highpoint, CityLink, freeway and airport access. Presenting excellent scope to add value, inspection will inspire.